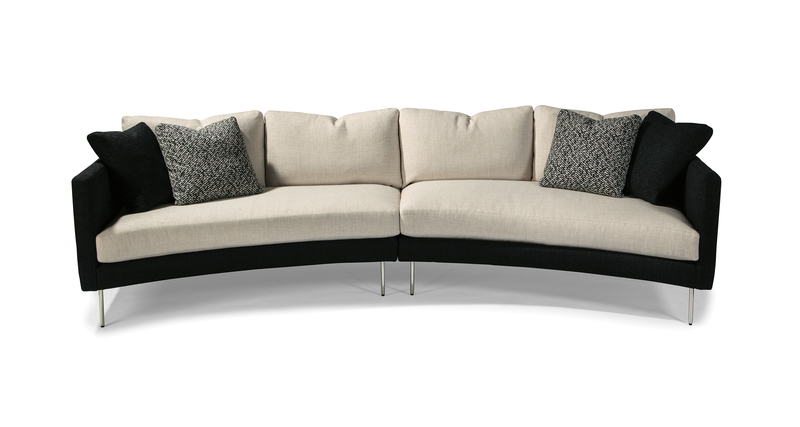 Designed by Ransom Culler, the Slice sofa is part of our extensive Slice modular seating collection. Let your imagination run wild with the seating possibilities with 12 distinct modular units available in the Slice system. Featuring gently curved frames, thin-lined legs and luxurious cushioning, Slice is an innovative and versatile seating system. Loose poly blend down seat cushions and fiber down loose backs are standard. Choose from dark bronze or polished stainless steel for legs. Select from any of our in-house curated fabrics or leathers for upholstery. Height to top of back cushion is 35 inches approximately. Sofas standard with two 18x18x2.5 inch box pillows. Legs available in polished stainless steel or dark bronze finish. Must specify.